Building on the success of previous field seasons, we are expanding the Search for the Slave Ship Trouvadore expedition’s mission for 2008. We will include excavation on the wooden wreck thought to be Trouvadore and we will also search for the U.S. Navy ships Chippewa and Onkahye, which wrecked on Providenciales in 1816 and 1848, while they engaged in the “cat-and-mouse” game of piracy suppression and slave ship interdiction. By 1825 most European and American nations had signed treaties to abolish slavery, but the trade continued well into the late 1800s. The British and U.S. navies played an important role in the international effort to end the trade in the first half of the 1800s. In a rare twist of fate, two U.S. Navy (USN) ships engaged in anti-piracy/anti-slavery patrols wrecked in the Turks and Caicos Islands (TCI) in nearly the same location. Not only are these ships two of only a handful of USN anti-piracy/anti-slavery patrol ships whose approximate wreck locations are known, but both have surprising pedigrees in the annals of naval construction. Together, the three ships represent both the “cat” and the “mouse,” and they illustrate the risks taken by illegal slave traders and the U.S. Navy’s commitment to eradicating the practice. The almost 200 Africans on board the Trouvadore were rescued by local authorities and freed. Although a few went to Nassau, the vast majority stayed and are the ancestors of many of the people who live in the Turks and Caicos Islands today. For more information read about the 2006 field season’s expedition. Trouvadore Search: Several archival documents refer to Breezy Point as the wreck location of Trouvadore. A visual survey in 2004 searched an area about 5.5 kilometers (3 1/2 miles) long by 800 meters (2,625 feet) wide. In 2006, a magnetometer was used to search the same area to locate any wreck debris not visible on the surface. In 2008, the outside area from the reef seaward to a depth of about 12 meters (40 feet) between Lorimer’s Point and Drum Point will be searched, using both the magnetometer and towed divers. 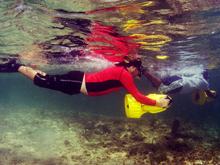 Together these surveys will comprise the first comprehensive underwater cultural heritage survey undertaken in the TCI and, as such, can serve as a model for future work in the islands. U.S. Navy Ships Search: Two archival documents describe the loss locations of the U.S. Navy brig Chippewa and the U.S. Navy schooner Onhkaye. They are the Proceedings of a Naval Court of Inquiry. Both of the ships’ captains and crews were questioned during these proceedings. As a result, their locations were described and recorded within months of the incidents. (It is still standard practice to convene such inquiries whenever a ship is wrecked or lost.) The 2008 search area extends approximately three nautical miles around Northwest Point, off Providenciales. In areas where it is not practical to tow snorkelers and when there are large areas to be covered, the diver propulsion vehicle (DPV) is an extremely useful tool. Light, agile, and similar to a small motor scooter, the DPV can be run at various speeds to accommodate changing conditions. Click image for larger view and image credit. An innovative low-tech approach that has proved extremely effective will be used again this season. The search paths and site locations are recorded using hand-held, data-logging global positioning system (GPS) receivers in conjunction with highly detailed, digital, “geo-referenced” aerial images. Geo-referencing is a technique that imposes map grid coordinates on an aerial image so that it can be used like a map: all measurements and directions taken from the image are true and tied into standard mapping conventions. We use the universal transverse mercator (UTM) grid convention to facilitate distance calculations. The high-tech approach will employ a remote-sensing package consisting of a magnetometer and differential global positioning system (DGPS) to survey inside and outside the fringing reefs in both search zones. The DGPS provides sub-meter accuracy for the location of any target or anomaly. Specialized navigation software will allow the magnetometer team to process and edit the data in the field to identify targets for diver follow-up. On top of the reefs and in the shallow outcrops the low-tech approach is most appropriate. Towed divers and diver propulsion vehicles (DPVs) will allow speedy coverage of large areas. As sites are identified by the magnetometer or towed diver teams, they will be buoyed; and photography, mapping, and limited sampling, if appropriate, will follow. The testing in 2006 revealed that the site is larger, more deeply buried, and (though not intact) better preserved than we thought. Testing exposed an unusual feature: the ship’s framing pattern alternates full-floor timbers running all the way across the keel with half-frames that terminate on top of the keel. Samples taken from structural timbers revealed the hull was made of oak. A small number of artifacts were collected, including ceramic fragments; however, none of them proved particularly diagnostic. While the clues are tantalizing hints to the identity of the ship, it will be impossible to make any informed decision regarding its true history until we can determine its length and breadth with accuracy. For that reason, we will excavate more in 2008. Three areas are of particular interest: the thick bed of turtle grass, the middle of the ballast mound, and the area between the keel and exposed knees. Ample archival sources exist that describe both Chippewa and Onkahye in detail, including facsimiles of construction drawings. A diagnostic feature of Chippewa’s remains is the vessel’s armament. The brig was armed with two long 18-pounders, two long 12-pounders, and a complement of fourteen 32-pounder carronades — for a total complement of eighteen guns. Carrronades were short-range, comparatively light-weight cannons mounted on special slide carriages. 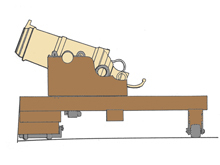 This type of cannon, invented at the Carron Foundry in Scotland in 1779, was very popular at the end of the 18th century and the beginning of the 19th century. Because they were popular, slight variations in their design, such as the presence or absence of trunnions (pivoting pins), help to date them. This illustration is of an early style. According to archival documents, Chippewa was carrying fourteen 32-pounder carronades in addition to other cannons. Mouse over image for larger view and more information. In the aftermath of the wrecking event, attempts to warp it off the reef resulted in the loss of the starboard bower anchor. Shortly thereafter, both masts were cut away. The iron hardware from the masts and the rudder, wrenched from the hull during the wrecking event, may still remain on the reef, along with the bower anchor and its carronades and/or long guns. The most unusual characteristic displayed by Onkahye was the shape of its midsection. The structure was formed from U-shaped frames, was extremely thick, and gave the appearance of being attached to the hull of a shallow-drafted vessel. Following its sale to the U.S. Navy in 1843, the centerboards were removed and replaced with bilge (sister) keels on either side of the shoe. In addition, two cannons of undetermined type and caliber were installed as armament. If elements of Onkahye’s hull still survive, it may be possible to identify one or more of the schooner’s unique design attributes and later modifications.